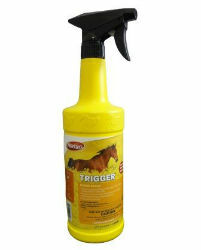 Trigger is a 1.0% Cypermethrin horse spray that protects against biting & nuisance Flies, Gnats, Mosquitoes (Culex spp.) and stays active for up to 14 days. Trigger Horse Spray is now SWEAT & WEATHER RESISTANT!